“Hana” is the Hawaiian word for “Bay” and “uma” refers to the shape of the indigenous canoes. With over 300 different fish species living in the coral reefs and picturesque beach, it’s easy to see why Hanauma Bay Nature Preserve is a must visit for any trip to Oahu, Hawaii. 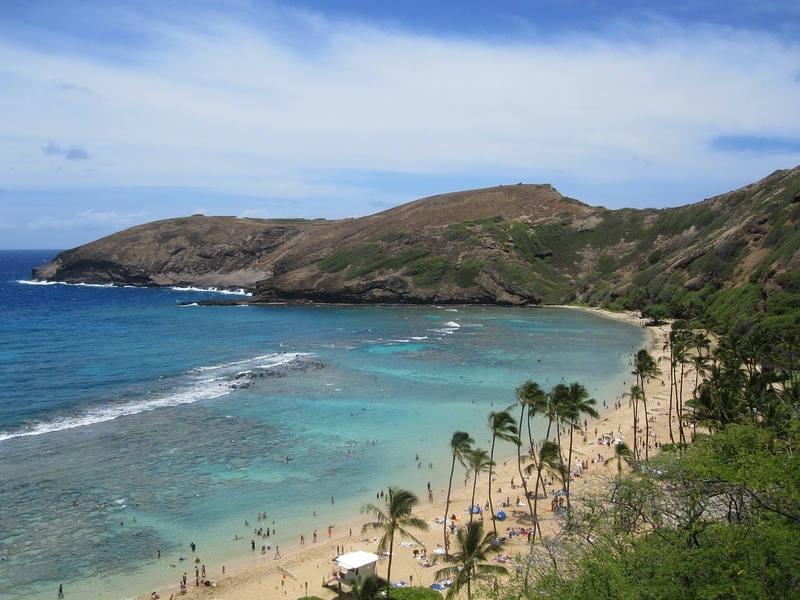 Hanauma Bay is so popular that overuse has become an issue for the bay creating coal and habitat destruction. In 2002 a marine education center was opened requiring first-time visitors to watch a 9-minute video to learn about conservation and protection of the wildlife and coral reef. Visiting Hanauma Bay Nature Preserve, with its pristine beach, coral reefs, and wildlife requires you be your best you. Do your part and more. Don’t feed, chase or touch the wildlife. Turtles too! Don’t touch or take souvenir coral (fish live there). Wear coral reef safe sunscreen. Pick up trash if you see it. Parking can get tough for those who don’t arrive early to nab one of the 300 parking spots. Taking a shuttle bus from Waikiki might be the best option for those who want to sleep in. Address: 100 Hanauma Bay Road, Honolulu, Hawaii 96825. CLOSED on Tuesdays, Christmas and New Year’s Day. Some shuttle buses to Hanauma Bay include snorkel gear. Get to the bay early! The parking lot fills early and you will be turned away if it is full. Getting an early start will help you avoid the long lines at the ticket booth and snorkel concession. Take your own snacks/drink, as the onsite snack bar is very expensive. Bring your own snorkel gear and use it over and over.